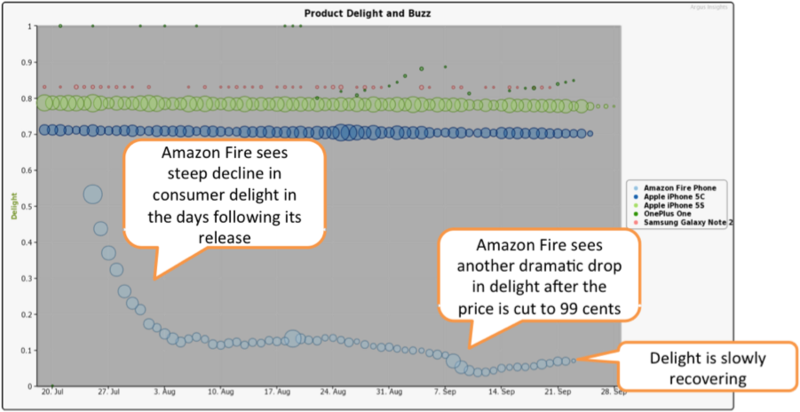 What Extinguished Amazon Fire Phone Sales? Sales records have been a reliable indicator of the failure of Amazon’s Fire Phone. Although Amazon does not release exact sales data, analysts report that Amazon saw less than 35,000 phones sold in the first 20 days after its release in July of 2014. At the price of $199 with a 2-year contract, it seemed consumers were not interested in Amazon’s smartphone. After these less than impressive sales figures, Amazon dropped the price of the Fire to 99 cents the day before Apple unveiled their new iPhone 6 and iPhone 6 Plus. After this seemingly desperate move failed to fire up sales, it became clear that the retailer known for providing the best values fell short with the Fire. The Internet is ablaze with articles blaming everything from price to the operating system to AT&T exclusivity for the phone flop. Argus Insights aims to discover the true reasons for the Fire failure by going straight to source: the consumer base. Examining consumer buzz and delight throughout the life of the Amazon Fire presents a clear image of the phone’s flop. Slashing the price helped Amazon briefly renew conversation about the Fire, but after people shelled out a measly $1 for the smartphone, they were even more disappointed than before. What exactly about this phone caused such distain? There have been negative responses to several aspects of the phone. Looking to the content of consumer reviews, we found that people complain most about the speed and performance, but have the most animosity about needing to return the phones. Customers were unhappy with the support they received from both AT&T and Amazon when they decided they did not care to keep the Fire. Complaints warning others to “BEWARE” of the “35.00 (dollar) restocking fee,” and outlining AT&T’s “poor service” are prevalent, and seem to critically increase people’s frustration surrounding the Fire. The rest of the funnel represents the most common areas of complaints. Ranging from quality, to usability, to battery life, to price, there were an overwhelming amount of negative comments across the board. This chart shows the specific areas in which the most consumer comments were concentrated. Amazon released a subpar phone, and then failed to deal with returns in a satisfactory manner. The Fire phone was ultimately a disappointment, but Amazon’s good reputation as a retailer could carry them past this smartphone disaster. 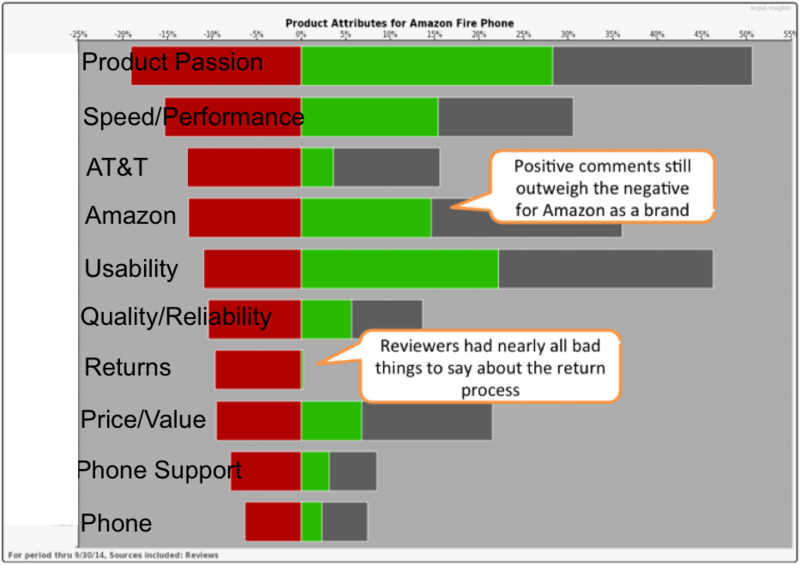 Positive comments about Amazon as a brand are still slightly more prevalent than negative ones. The Fire did not burn bright, but it may have burned some bridges. Amazon greatly disappointed their customers with this not-so-smart phone, and while consumers continue to talk about Amazon, the conversation is increasingly nasty. It’s said that all press is good press, but does Amazon have the brand strength to recover? With a recent launch of 6 new tablets on September 18th, they have a chance to impress. Visit our Argus Insights website for more information or to contact us for portal access, personalized analysis, tailored reports, and more!